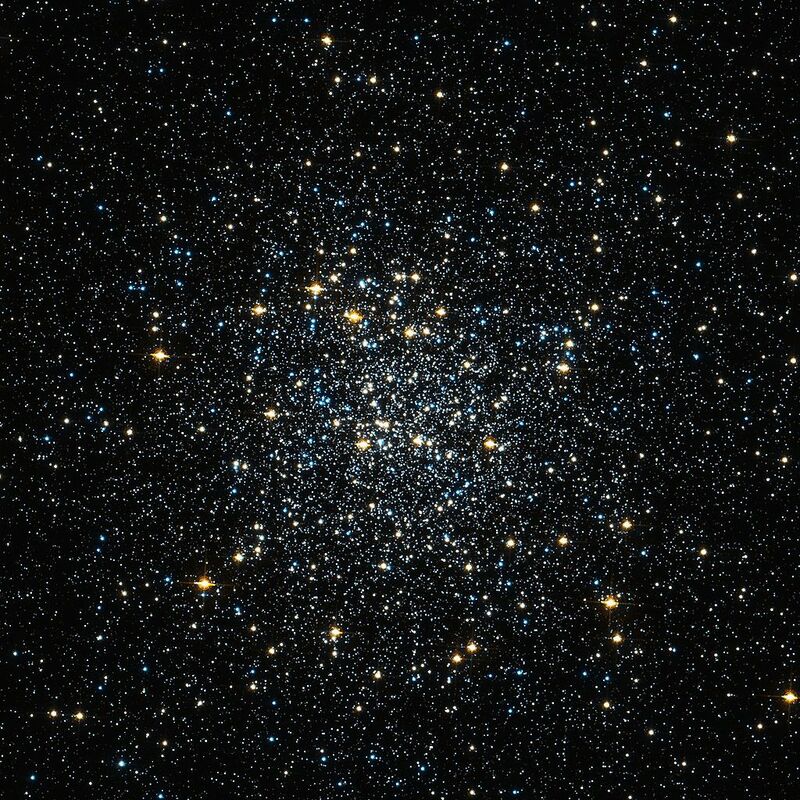 Messier 92 (M92) is a globular cluster located in the northern constellation Hercules. The cluster lies at a distance of 26,700 light years from Earth and has an apparent magnitude of 6.3. Its designation in the New General Catalogue is NGC 6341. Messier 92 occupies an area of 14 arc minutes of apparent sky, which corresponds to a linear extension of 109 light years. It is positioned north of the Keystone asterism in Hercules, between the Keystone star Eta Herculis and Iota Herculis. The cluster lies about 60 percent of the way from Eta to Iota. It forms a triangle with the two northernmost stars of the Keystone, Eta and Pi Herculis, which form the widest part of the asterism. M92 can also be found by first locating the bright Etamin (Eltanin, Gamma Draconis), an orange giant in Draco, and then moving about 6 degrees in the direction of the Keystone. In 10×50 binoculars, M92 appears like a blurry star with a brighter core. Small and medium-sized telescopes will resolve some of the stars in the outer regions of the cluster. 6-inch and 8-inch telescopes show an oval-shaped cluster with a bright centre, surrounded by a halo of stars. 12-inch telescopes resolve dozens of individual stars in the halo and throughout the cluster. 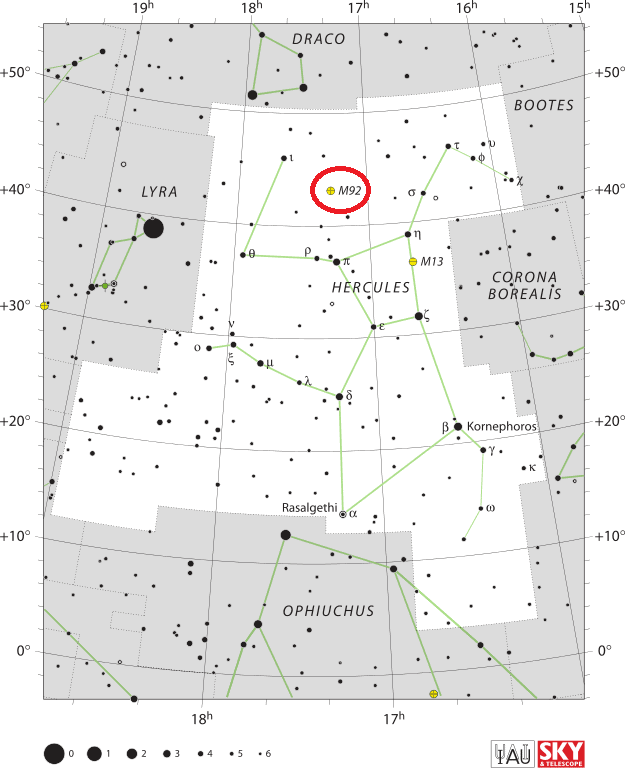 The best time of year to observe M92 is during the summer, when Hercules is high overhead in the evening for northern observers. Messier 92 is one of the brighter northern globulars – both visually and in terms of absolute magnitude – and can be seen without binoculars under good conditions. 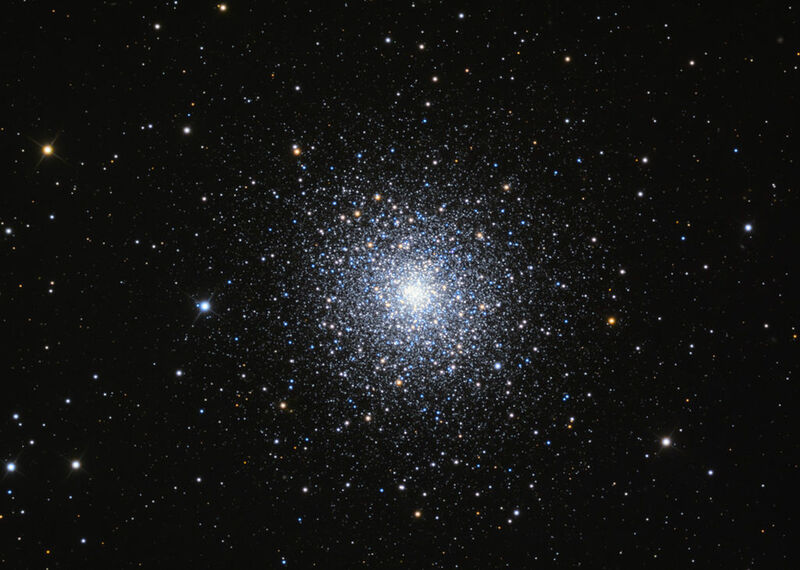 It is, however, not as popular a target for amateur astronomers as the brighter and larger Hercules Globular Cluster (M13), which lies in the vicinity. M92 has a much denser core and is more difficult to resolve than M13. Messier 92 has an estimated mass of up to 330,000 solar masses. The cluster is approaching us at 112 km/s. 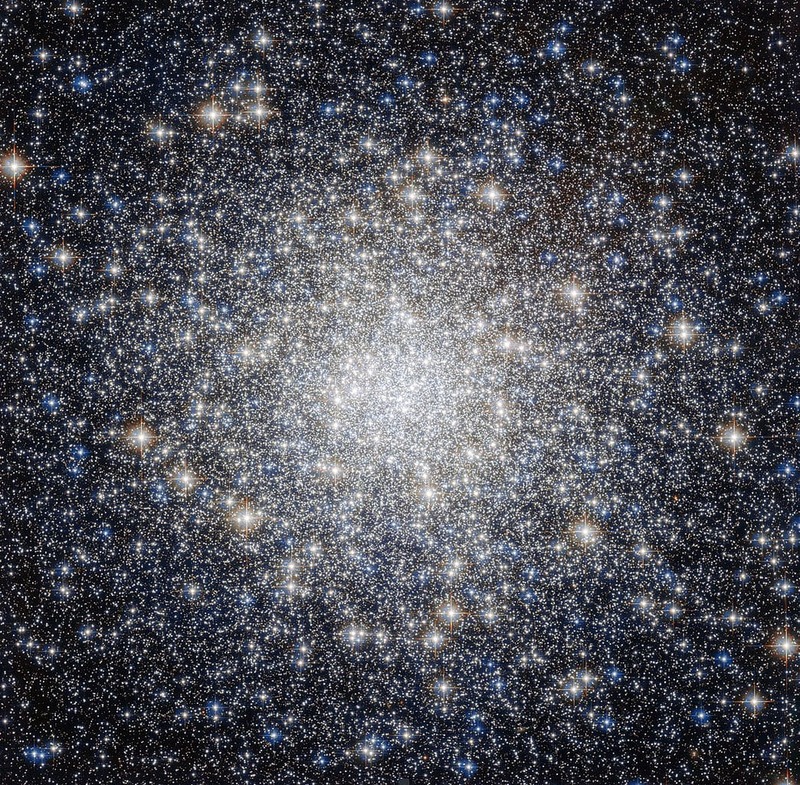 With an estimated age of 14.2 billion years – almost the same age as the universe itself – M92 is one of the oldest clusters known and possibly the single oldest globular in the Milky Way. The cluster has an extremely low abundance of elements other than hydrogen and helium, with only 0.5 percent of the Sun’s metallicity. 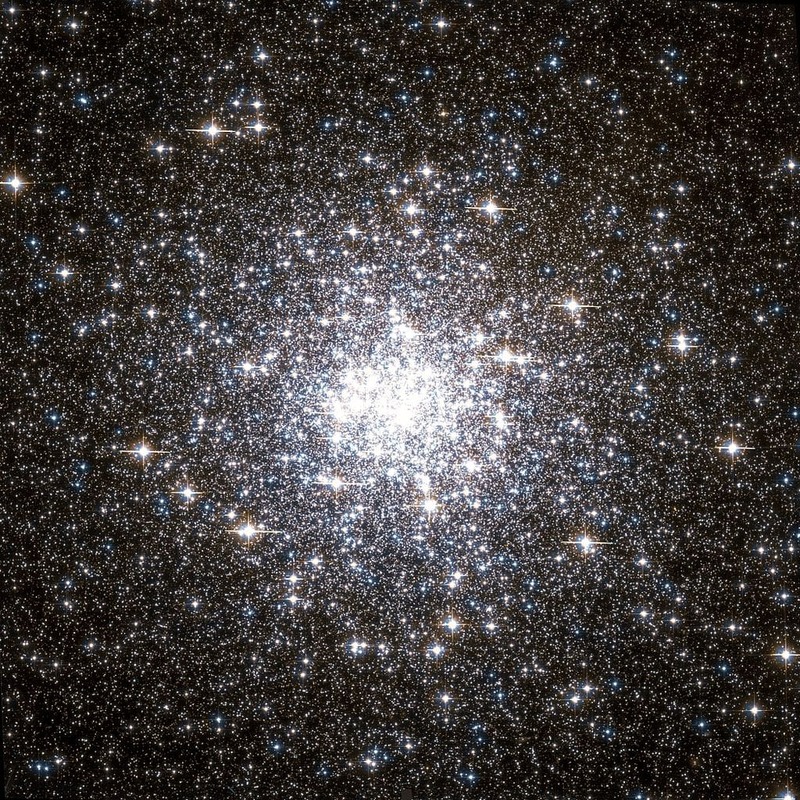 Messier 92 is classified as an Oosterhoff type II (OoII) globular cluster, which means that it is a metal poor cluster with longer period variable stars of the RR Lyrae type. It contains 28 candidate variables, of which 20 have been confirmed. These include 17 RR Lyrae variables and a W Ursae Majoris type variable, an eclipsing binary star whose two components share an envelope of material and are in contact with one another. Messier 92 also contains 10 X-ray sources within the 1.02 arc minute half-mass radius. Half of these are suspected to be cataclysmic variables, close binary stars that that have outbursts in brightness at irregular intervals as a result of one component, a white dwarf, accreting matter from the companion. As a result, an accretion disk forms around the white dwarf and outbursts occur when a portion of the disk falls onto the star. The cluster is located about 16,000 light years above the galactic plane and 33,000 light years from the galactic centre. Its tidal radius extends across an area of 15.17 arc minutes. The half-light radius of M92 (radius containing half of the cluster’s light emission) is 1.09 arc minutes. The core of M92 has a radius of about 2 seconds of arc. The north celestial pole will come within a degree of M92 in about 14,000 years. Every 26,000 years, the Earth completes a precession of its axis and, during that cycle, the pole moves near M92. M92 was last a pole cluster back in 10,000 B.C. Currently, the pole is pointing toward Polaris, Alpha Ursae Minoris, the brightest star in Ursa Minor constellation. On this occasion, I also want to announce that on December 27, 1777 I have discovered a new nebula in Hercules, not known to me, southwest below the stars in his foot, which shows up in a mostly round figure with a pale glimmer of light. Its longitude is about 11 deg [Sgr] [251 d] and its latitude 66d north. Together with two small stars, which don’t occur at Flamsteed, it appears in the reversing telescope as shown in fig k (in the following volume). William Herschel was the first to resolve the cluster into stars using a 7-foot telescope in 1783. A globular cluster of minute stars, preceding the right leg of Hercules. This object is large, bright, and resolvable, with a very luminous centre; and, under the best vision, has irregular streamy edges. 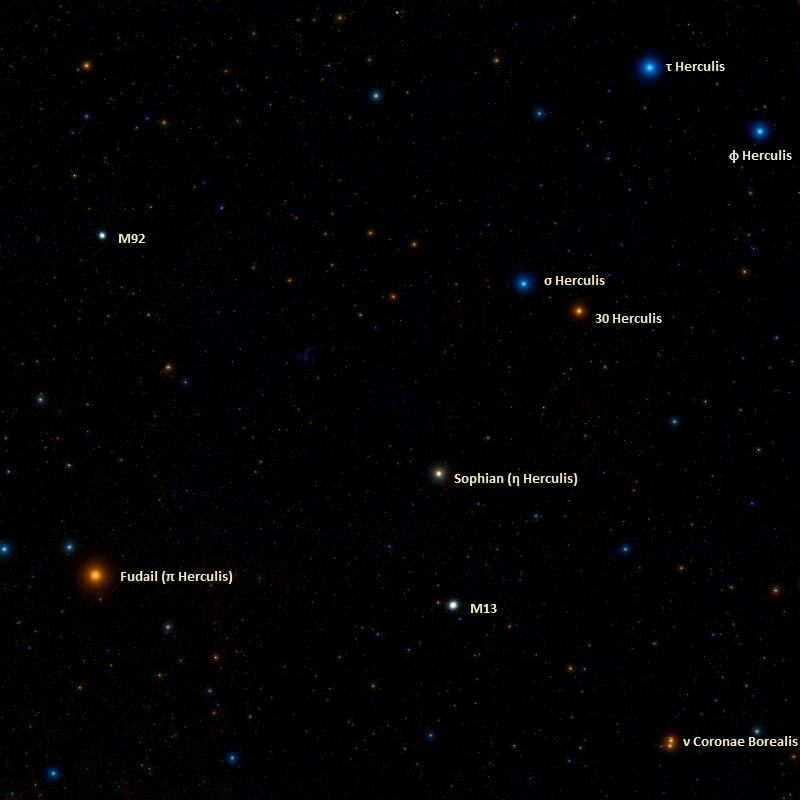 It is immediately preceded by a 12th-magnitude star, distinct from the outliers, and there are several other stars in the field, of which the brightest is of the 7th magnitude in the nf [north following, NE], with a Delta AR = 28s. Messier, who enrolled it in 1781, remarks that “it is easily seen with a telescope of one foot [FL];” and it really demands very little optical aid to render it visible. Messier’s own instrument did not, it seems, resolve it, for he compares the shining centre, with its attendants, to the nucleus of a comet surrounded by nebulous matter; but of course, it rose into a brilliant cluster, of 7′ or 8′ in diameter, before the reflectors of Sir W. Herschel in 1783. The mean place was obtained by carefully differentiating the cluster with Eta Herculis, from which it bears north-by-east, 1deg 1/2 distant; bearing to the north of Alpha Herculis, and west of Wega.